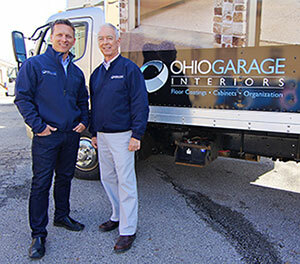 Locally owned and operated by the father and son team of Chad & Scott Gleske, Ohio Garage Interiors specializes in garage enhancement, which involves the installation of high-end polymer garage flooring coatings, cabinets and storage systems. With Ohio Garage Interiors, they can help you get organized and clean so you can focus on what really matters. As the specialist in custom garages and storage solutions for the entire home, they can create beautiful and practical solutions to meet all your organizing needs. Not only does Ohio Garage Interiors offer garage flooring but they also offer near-endless choices to create your personal organized garage…choose from cabinet storage, shelving, or wall storage with durable accessories. They only use products that are designed to meet the specific challenges of the harsh garage environment and they purchase them from companies around the country that only have a reputable reputation. They not only offer the highest quality products but the team can provide responsive, up-to-date technical assistance as well as knowledge in the latest equipment advances and installation techniques. All installers are employees of Ohio Garage Interiors which means no subcontractors and no extra hassle or cost for you as the customer because they want to ensure quality work. Chad & Scott and the rest of the Ohio Garage Interiors team only contract the volume of work in a specific time frame that they know they can handle with their employees. This ensures quality work and allows them to schedule jobs intelligently so they will be finished on time and done with their high level of expectation and skill. Call Ohio Garage Interiors today for more information or call for a free in-home estimate! Let the experts re-invent your garage.